An annual event: The spring workshops at Cat’s Corner are put on every year to offer the community an opportunity to learn and be inspired by invited artists and bring together dancers of all levels in a learning experience. In this 2019 edition, Cat’s Corner presents The Vernacular Spectacular! This year, we’re dreaming big. We strongly believe that Jazz dance cannot exist in isolation. It needs external influences to grow and be part of a living culture. Click on each tab below to see the detailed description of the program. One hour to listen to Travis geek about his favorite clips. Watch the finest tap and jazz dance there ever was. Train your eyes to see the richest details and mastery of of the dance royalty. Jam with your taps and soft shoes. Open your ears and share your moment with a circle of individuals who are here for the same purpose: living through the rhythm of jazz. All welcome. From novice to experts, we will be one circle of dance. Join us for our weekly Downtown Stomp dance, including our regular intro class and intermediate lesson at 8:30pm. From 9:30pm until the last happy feet will be ready to go to sleep, the room will be filled with swinging souls and bodies, dancing to the hottest recorded big bands. The lineage of social dances from African-American culture is vibrant. From solo jazz to hip hop, from apple jacks to the rooftop, we’ll explore the vocabulary of solo jazz and how these dances have shaped modern street dances. Celebrating the life and enormous contributions of a remarkable woman and artist, this class will look at the signature moves and moments of African-American dancer and performer Mabel Lee (1921-2019) and shape her legendary dancing into a choreography. You’ve got the moves down pat, so now let’s look at how we can take your dance skills to the next level by working on showmanship, personal presentation, and overall self-expression through the entire body! We will look at tips and tools to help you connect with your audience, your dancing peers, and yourself while showcasing and performing your personal style and dancing. Jazz dance and tap dance draw inspiration from the same root, jazz music. In this session we compare steps shared by both styles in order to connect more to jazz dance. Feel the ground underneath you and listen for how it responds with sound that supports your groove. This session is about gaining a richer connection to the music you love to dance to. Before standardized education, before the first syllabus, storytelling and one on one transmission was how jazz was shared. In this session, we reconnect with the Oral Tradition of Jazz and establish a deeper more personal connection to the music that moves you. There are many different approaches to performance. In this session we will focus on two. We will contrast presentational performance with introspective performance. Is it possible to engage in both types in the same performance? The night will be special, sensational, spectacular! That’s all there is to say. 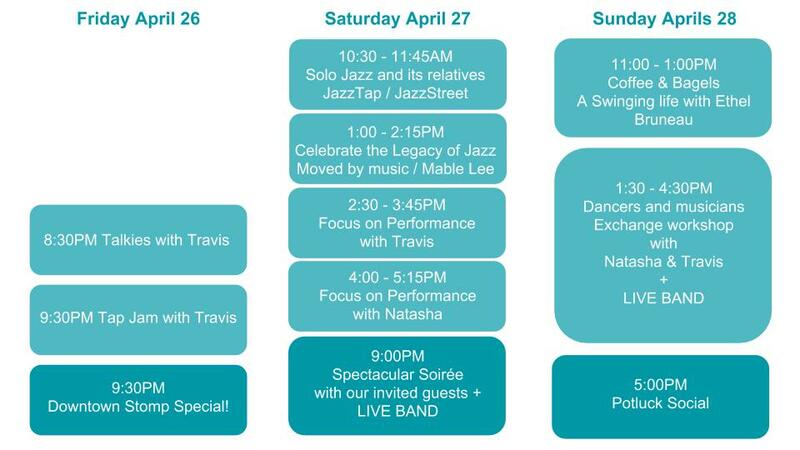 To the sound of Emily Estrella’s swinging band, we will be dancing, rejoicing and celebrating the beauty of jazz with our special guests, Natasha Powell and Travis Knights who are working on a unique experience for you all. We might have a third very special guest joining us to make our heart sing and pump harder through the night. Here is our line up of musicians! This morning, we will get together around Ethel Bruneau and our guests as she will share stories and thoughts about her life, her dreams, the people that raised her to spend such a swinging time on earth. This will be part of a Tap Love Tour podcast discussion between Ethel, Travis and Natasha. During these 3 hours, musicians and dancers will get together to exchange thoughts and practices and to better understand one another to create magic on the dance floor as one. Guided by our guests, Travis and Natasha, this LAB will take us to the land of dreams where music is dancing and dancing is music. We will end the day and this spectacular weekend with food, carefree dancing and relaxed conversation between one another. Bring some plates to share and enjoy the light of our beautiful space. They have dedicated their art and their dance to jazz, to it’s unique language, to understanding its traditions and to its future potential. They are two accomplished artists whose work has been praised by their peers and critiques. They came to Vernacular Jazz through tap dance and urban social dances. Their multiple influences distinguish them and their unique contributions to movement and dance. “Tap Dancer. Performer. Choreographer. Speaker. Believer. Montreal native Travis Knights is realizing his dreams, pounding rhythms on wood floors all over the world. His talent and dedication have earned him audiences in Shanghai, Dusseldorf, Paris, New York, and Vancouver. His career started in 2000, when he was cast as a principal dancer in the motion picture biography of Bill ‘Bojangles’ Robinson with Gregory Hines and Savion Glover. The film, entitled ‘Bojangles’ was choreographed by Henry LeTang. In 2006, he was tapped to be the principal dancer in the video game adaptation of Warner Brother’s ‘Happy Feet’. In 2007 and 2008, Travis participated extensively as a Tap Dance consultant for Cirque du Soleil. Since then, he has performed in Tandem Act Productions’ ‘Diary of a Tap Dancer’ at the Apollo Theatre, and the touring show ‘Wonderland: A Tap Tribute to Stevie Wonder’, created by Ayodele Casel and Sarah Savelli. Natasha Powell is a Toronto-based dancer, choreographer, producer, and founding artistic director of Holla Jazz. Born to a Grenadian mother and Jamaican father, Natasha’s first exposure to dance was through family social gatherings, basement parties, and backyard barbeques hosted by her parents and elder siblings. With an older brother and sister growing up in the height of the hip hop era, it was only natural for Natasha’s dance practice to be rooted in the social dancing. Enrolled in ballet, modern jazz, and tap classes from the age of nine, Natasha’s vocabulary encompasses a wide rage of dance styles that also include hip hop, house, and vernacular jazz. She has trained with North America’s top instructors in the field from New York, Toronto, Los Angeles and Vancouver and continues to be a student to the craft at all times. An injury forced Natasha to take a slight pause, but also introduced her into the new territory of her creative career – of jazz dance. Grant awards from the Canada Council and Ontario Arts Council supported her New York residency research period, guided by Professor Moncell “iLLKozby” Durden and support from Margaret Batiuchok, Nathan Bugh to study the roots of jazz dance, lindy hop, and their connection to the popular street dances as we know them today. This residency was the birth of new creative chapter for Natasha leading to creation of Holla Jazz – an arena where all jazz dances, hip hop, and house intersect to reinvigorate the idea of freedom and unity of the dance styles that bring meaning and feeling to our dancing bodies. This weekend of workshops will allow you to deepen your understanding of multiple fundamental aspects of the dance, oral teaching traditions, external influences, social dances, stage performance and the importance of music at the center of it all. Open to all levels! An experience that you will not want to miss. Everyone is welcome! Prerequisites: a desire to learn, to listen, to watch, to feel. Jazz is for all. Jazz is for you!